Honorees at North Fork Audubon’s holiday party Dec. 3. 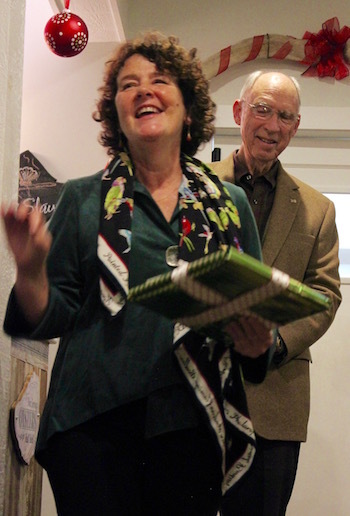 The North Fork Audubon Society honored Robin Simmen and Dr. William Zitek for their commitment to wildlife, particularly the avian kind, at their holiday party Dec. 3 at Case’s Place in New Suffolk. Dr. William Zitek, who ran the North Fork Animal Hospital for more than three decades, is moving down south with his wife, Mariel, leaving behind a legacy of a career spent caring for both domestic pets and wild animals, while Robin Simmen, a Community Horticultural Specialist at Cornell Cooperative Extension of Suffolk County, helped North Fork Audubon build a native rain garden at their headquarters at the Red House at Inlet Pond County Park in Greenport. At North Fork Audubon’s native garden this summer. Ms. Simmen also coordinated a team of 30 volunteers who helped put together the garden. “We’re so thankful we have a garden we can now use as a demonstration garden. We can bring school kids to come and learn about understanding the importance of recycling rain and planting native plants,” said Ms. O’Kane. Ms. Simmen thanked the volunteers who worked side by side to put the garden in. Ms. Simmen said all of the plants in the garden are “genotypically true and bred here on Long Island,” except for one agastache that she found out later was native to the northern midwest. Cornell Cooperative Extension provided a grant for the project, and the Long Island Native Plant Initiative provided 100 plants. Island Perennials and Jim Glover also provided plants. Mr. Glover provided her favorite, a fragrant Clethra alnifolia or coastal sweetpepperbush, which they placed at the entrance to the Red House in honor of North Fork Audubon past president Maureen Cullinane, who died last year. Dr. Zitek “has been responsible for taking care of so many of our pets and injured wildlife out here,” said Ms. O’Kane, who said that from gluing sea turtle carapaces back together to splinting birds’ wings, Dr. Zitek has done a great deal to help wild animals. He is also a member of the Bluebird Society, and has helped put bluebird houses throughout Mashomack Preserve on Shelter Island, where nearly 700 bluebirds have fledged since the program began. Robin Simmen and Dr. William Zitek at North Fork Audubon’s holiday party. “Mariel and I were very lucky to come out to Southold just 50 years ago,” said Dr. Zitek, who said that he’s been helped tremendously over the years by community members who share his commitment to wildlife. “If I had an injured osprey, I found a freezer full of fish at the front door of the animal hospital,” he said. Dr. Zitek said that he had just served as a judge at the Shelter Island School’s science fair, where he was impressed with the students’ engagement and the quality of their projects. Dr. Zitek said the challenges facing the environment today are huge, and he’s glad to know North Fork Audubon has so many volunteers devoted to providing programs for the community, and for young people, to learn more about the natural world. “You need to have a little bit of wonder in your mind,” he said.